"Education is the most powerful weapon"
"Training communities to make a difference"
NAMMA MITRA works on a wide range of projects connecting with numerous villages and rural communities across the regions of Karnataka . We ensure that our administrative costs are kept as low as possible so that most of our donation go directly to support our charitable aims. Volunteering with us could help you choose a new direction in life or develop a career path you may already be on. Founded by Dr Seema, NAMMA MITRA works on a wide range of projects connecting with numerous villages and rural communities across the regions of Karnataka . Namma Mitra strives to make a difference to develop sustainable employment and business opportunities for rural people, providing them with skills that can also be passed on to future generations. or generation Rural Indian villagers have been involved in various small scale occupations out of which, agriculture is the primary one. 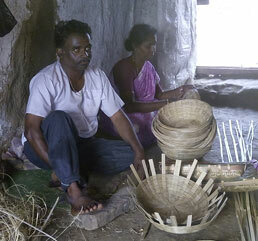 Apart from agriculture, the villagers are also involved in other occupations like weaving and cottage industry. Land available to each family has remained the same while the family members have increased, income support from agriculture alone is becomes difficult.